Ultra 5 recently discussed some park improvements. Please click HERE to see a sumary of the changes. LCEC has sent an important notification concerning some electrical work they will be performing in Laurel Estates. Please click HERE to read the notification letter. Set in a quiet corner of North Fort Myers, Laurel Estates' residents have the best of everything--beautiful southwest Florida living close to shopping and many fine restaurants, easy access to Interstate 75, and a short drive to superb Gulf Coast beaches. Laurel Estates provides Florida living at its finest with independently owned homes on quiet palm tree lined streets. 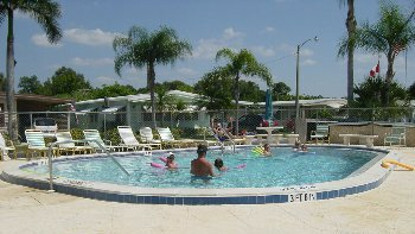 The centrally located club house and swimming pool are busy year round with numerous activities and parties. Activities in the park, coordinated by the resident run Laurel Estates Lot-Owners, Inc., Social Committee, include bingo, bocce, crafts, dart baseball, golf, line dancing, shuffleboard, softball, and many more. Just across the Caloosahatchee River is Fort Myers, home to the Thomas Edison and Henry Ford winter estates and spring training homes of the Boston Red Socks and Minnesota Twins. Fort Myers offers numerous shopping and fine dining establishments, museums, nature parks and trails, river and gulf cruises, and gulf fishing charters. A short distance further brings you to the beautiful gulf beaches of Fort Myers Beach and Sanibel Island.